DGCEC is humbled and honored to welcome Drepung Tripa Rinpoche Khensur Lobsang Tenpa to our center for this free public talk! Over the last 20 years DGCEC’s spiritual teacher, Geshe Rapgyal, has had opportunities to receive many special teachings from Rinpoche, a treasured and revered teacher and practitioner. Please join us! The current Drepung Tripa (The Throne Holder) and former Abbot of Drepung Monastery, Khensur Lobsang Tenpa, was born in the year 1938, in Amdo province of Eastern Tibet. He became a monk at the age of 11 and was ordained at Taktsang Lhamo Monastery. At the age of 18, he traveled to the south of Lhasa where he joined Drepung Gomang Monastery. In 1959, he fled Tibet when the Chinese invaded following H. H. the Dalai Lama into India. He stayed at a transit camp for ten years. In 1970, he entered Varanasi University, Central University of Tibetan Studies, where he obtained the Acharya degree with remarkable and excellent results. In 1973, he returned to Drepung Gomang Monastery where he studied the advanced course on Higher Knowledge (Abhidharma) and the Monastic Discipline (Vinaya) subject. In 1982, he sat for the Gelug examination in which he ranked first of all the candidates from the three great monasteries. In 1989, Rinpoche was chosen by His Holiness the Dalai Lama to be the Head Abbot of Drepung Gomang Monastery. Following that, in 2007, he was appointed by His Holiness as Head Abbot of Drepung Monastery. Having attained great distinction in the Buddhist Sutra and Tantra doctrines,Rinpoche is considered one of the top scholars in Buddhist philosophical teaching, composition and debate. He continues teaching on subjects of the Buddha’s discourses and higher Secret teachings. He has also traveled to give teachings in Tibet, Russia, Mongolia and Europe. 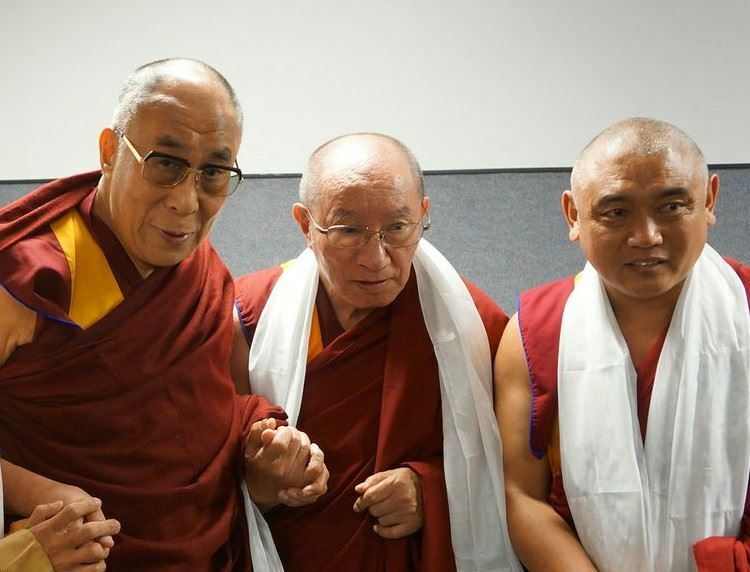 During the visit of His Holiness the Dalai Lama to Louisville in 2013 Rinpoche represented the Abbot of Drepung Gomang Monastery. This is Rinpoche’s third visit to the United States.